Better World Books, online at BetterWorldBooks.com, is committed to supporting global literacy. Better World Books sells used books to fundraise for literacy initiatives around the globe. The titles at Better World Books number in the millions, and with free shipping in the US, how can you resist? When you shop at BetterWorldBooks.com, you help the environment and save books from ending up in landfills. Go support the cause today -- but first, check RetailSteal.com for Better World Books discounts, Better World Books promos, and Better World Books coupon codes. Better World Books offers free shipping on US orders, and $3.98 worldwide. Find 7 different types of shipping services; Used book orders ship within 1-2 business days, and new book orders ship within 1-3 business days. To receive a refund, return item within 30 days of purchase. International customers get 45 days to return an item. See website for full details -- certain exclusions may apply. 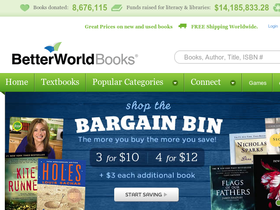 Use this coupon code to save 10% on your online purchase of 2 or more books from Better World Books. Click link for savings. Save 20% up to 90% on bargain books plus get free shipping when shopping online at BetterWorldBooks.com. Click to save. Click our link to shop at Better World Books today and use our coupon code to save 10% on your purchase of two or more books. Shop the Third Thursday Flash Sale and save 40% at Better World Books when you buy three or more books. Click to shop and save.